Today is the 50th anniversary of 2001: A Space Odyssey. This post is about the London locations related to the film, plus a look at the film’s UK premiere, including a run down of the actual date in question and the errors that were perpetuated when stating the date of the premiere itself. Being a British film, 2001 was made in Borehamwood and consequently London has several locations connected directly or indirectly to the film. As reported yesterday in the first 2001 post, the world premiere took place in Washington DC. London had to wait four weeks for its premiere of the film. It was in May 1968, apparently on one of a number of given dates which ever blog or news source one read! Both these were fortunately right. It was 1st May 1968 when 2001: A Space Odyssey premiered in London. As part of the research to find out when the actual premiere had been held adverts for Casino Cinerama for 1968 were sought. Several examples published during April 1968 show future times of performances for 2001: A Space Odyssey (this is from 2nd May 1968) and the flash across the bottom of the page indicated the premiere was to be held there on 1st May 1968. Originally it had been mooted for the 11th April 1968. Whilst other cites around the world kept that date London’s, for unknown reasons, was moved to the 1st May. The Casino Cinerama in Soho was chosen because it was a notable venue for UK premieres because of its capability to screen Cinerama films. The premiere was in benefit of the Printers’ Pension charity. Regular screenings began on 2nd May 1968. The rest of the country had to wait a little longer however. Brighton & Glasgow were the first outside London to run screenings from 21 July 1968. Today the Casino Cinerama is the Prince Edward theatre. The Cinerama screen was removed in September 1974 and an ordinary screen was installed. Four years later on 29 March 1978 it became the Prince Edward theatre. Thus the theatre had its 40th anniversary a few days before the 50th anniversary of 2001. Not one person mentioned the theatre’s 40th anniversary – neither the venue itself nor its owners Delfont Mackintosh Theatres. There’s very little reminders of the days 2001 was shown at the Casino Cinerama. Apart from adverts for the film, photographs of the premiere seem almost non-existent. It was quite a low key affair compared to those that took place in the US. Kubrick didn’t attend neither did any famous celebrities. It was instead compromised of various top MGM bosses who had flown in from other parts of Europe. List of ‘celebrities’ for the UK premiere who happened to be MGM executives! The nearby Astoria in Charing Cross Road also had a huge curved screen as I remember this. However that was for the Todd-AO format, including Around the World in Eighty Days, Cleopatra and The Sound of Music. A very small number of films had cross-overs between the Cinerama/Todd-AO formats and one such rare film was 2001. Even if it couldn’t be shown in Todd-AO it certainly could be shown in the 70mm curved widescreen format – however I do not know if 2001 was ever featured at the Astoria. There’s one other London link between 2001 and the Casino Cinerama. David Bowie went to see the film several times in its first weeks of showing. From it he conceived and wrote the number one hit Space Oddity. Bowie says he felt ‘zapped’ by 2001. Hence we have Kubrick to thank for the likes of Ground Control and Major Tom! 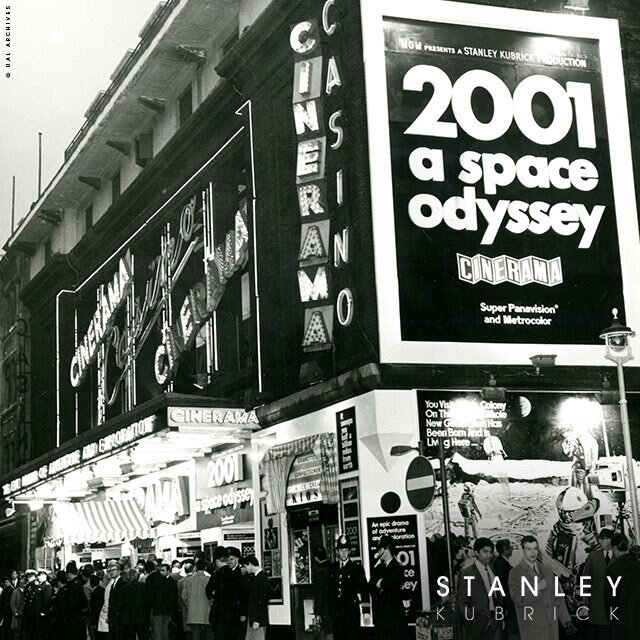 The original 2001: A Space Odyssey was never seen in any cinema outside the US, not even London. The film as originally made lasted just a few days. London, like the rest of the world had the final print with the oft debated 17-20 minutes that had been cut out of the original film. London is the home of the monolith belonging to 2001: A Space Odyssey (even though this is not as widely known as it should be…) Actually its not the famous black slab but the first ever monolith made for the film. It was very a expensive prop and ultimately rejected by Kubrick. The now celebrated 2001 black monolith was made of wood. A special mix of paint/graphite was used on it. rubbed down, painted again and so on until it glowed in the way Kubrick intended. The 2001 monolith at St Katharines’ Dock is said to be the biggest and heaviest acrylic block in the world. Originally it had a smooth surface, the sculpture you see upon it was done later. Kubrick didnt think it’s opaque presence looked mysterious enough. He saw it would give considerable problems with regards to studio lighting. That had to be spot on and if something showed a reflection or a stray ray of light it was no good. Was the monolith actually made in 1968 as is claimed on the plaque? Rather it seems it was made in 1966, the date is just that for the film’s release. Why is the original monolith at St. Katherine’s Docks when there isn’t any relevance in the docks to the film? Who knows! Anyway its on a wall and there’s a plaque to commemorate the fact it was made for 2001. Its not a location that seems ideal for it but there you are, we musn’t complain. Kubrick tried to get everything related to 2001 destroyed – the props, sets, the many hours of extra scenes, scripts, photographs. He didn’t want anything other than the film left in existence and as I wrote yesterday, apparently had sets from 2001 destined for Washington’s Smithsonian museum trashed instead – resulting in a huge claim against Kubrick/MGM for breach of contract. If anyone wants to get a sense of a monolith overpowering them, the police memorial by Horse Guards Parade is the place to go! This sited just off The Mall, is roughly the size and shape the monolith should be, and one can be in awe of this. I know its not black but then the first one made for the film wasnt! Its just a question of using one’s imagination. From certain perspectives it does look black. Anyone ever taken a night time pic of this London monolith with the moon directly overhead? Somerset House had an exhibition called Daydreaming with Stanley Kubrick in 2016. This giant director’s chair was featured on the riverside terrace for six weeks. Film Four Summer Screen had a special night during this exhibition showing one of Kubrick’s films which would be selected by voting. From ten films it was whittled down to just two – 2001 and The Shining got equal votes! The voting had to be redone. No-one would know the winning film until it came up on screen which happened to be The Shining. Moving on, the next location is the Dorchester. Kubrick and his family spent almost the entire period of filming for 2001 living at this famous London hotel. It would have been a fairly straightfoward drive for Kubrick from the hotel to the MGM studios in Borehamwood, using the A5 and then turning off through Elstree and into Borehamwood. There was no motorway from Brent Cross northwards. The M1 did exist from Junction 5 at Elstree northwards in those days but that would have been no use for Kubrick, and even if it had been built the way the junctions are laid out means one has to use the A5 anyway! Speaking of hotels, the ending of 2001 features a hotel room (space room, interstellar room, as others call it.) Kubrick is said to have got the designs for the 2001 hotel room from the Dorchester. Its not just the rooms they lived in, it seems Kubrick also got to see some of the other rooms and photographed these with the intent of using different elements to build up the interplanetary residency that forms an important part of the film. Few women were featured in the film apart from the first few minutes when Dr Heywood Floyd travels from Earth to the space station, then the Moon. The Aries IB Lunar shuttle stewardess was played by the actress Edwina Carroll. This the one who collected the food trays from the shuttle’s kitchen and then proceeded to walk upside down onto an upper level hatch leading to the flight deck. What does she have to do with London? When she gave up acting her life was devoted to the running of two shops in Covent Garden. Carroll’s shops no longer exist, it seems they closed in the early 1990s. The address of Carroll’s main shop was Unit 16, Covent Garden. The shop was described as one where quality gifts from fabulous knitwear to collectible objects d’art could be found. Today the site is the Miller Harris store. Miller Harris was originally set up in 1992 as Harris Oils (interesting timing!) The change to Miller Harris was made in June 2004. The company had one store nearby in Monmouth Street and took over the Covent Garden site in December 2013. Does Miller Harris’ displays remind one of the room where Dr Bowman deactivated HAL? The famous London fashion designer Hardy Amies, who was the Queen’s couturier, is the guy responsible for most of the costumes seen in 2001. The company’s store is in Savllie Row. The designer himself was born in London’s Maida Vale opposite the famous BBC studios at a time when this had only just been built and in use as an ice skating rink.